Sixty-five years after it first began producing cars in Australia, Holden has confirmed it will cease local manufacturing in 2017. The move ends weeks of intense speculation and years of uncertainty surrounding the General Motors’-owned brand’s Adelaide production line and Victorian engine plant from the company that was formed in 1856 and first started manufacturing cars locally in 1948. The announcement will send shockwaves through the struggling automotive industry, which has warned of upwards of 50,000 job losses. About 2900 Australian jobs will be "impacted" over the next four years as a result of General Motors' decision, the company said in a statement. This will comprise 1600 jobs from the Elizabeth vehicle manufacturing plant and about 1300 from Holden's Victorian workforce. 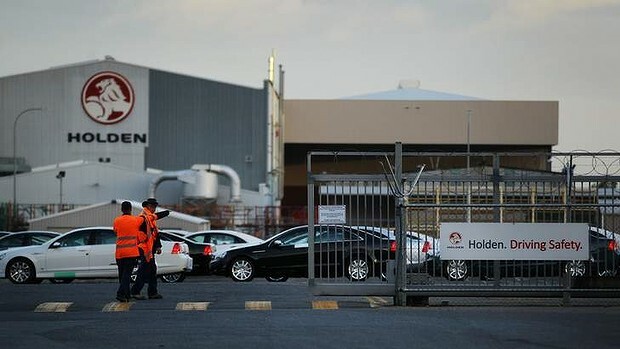 Holden released a statement saying it would "transition to a national sales company in Australia and New Zealand" from 2017, citing the strong Australian dollar, high production costs and the competitive local market for the decision. "This has been a difficult decision given Holden’s long and proud history of building vehicles in Australia," said Holden chairman and managing director Mike Devereux. "We are dedicated to working with our teams, unions and the local communities, along with the federal and state governments, to support our people." Acting Prime Minister Warren Truss confirmed he had spoken with Holden's Australian boss Mike Devereux about 10 minutes before Question Time, when he informed Mr Truss that the decision had been taken at the company's headquarters in Detroit. Amid booing from Labor MPs, who blame Holden's departure on the coalition's refusal to give more government funding to the carmarket, Mr Truss told Parliament that "like all members in the house, we regret the fact that GM is to phase down its operations in this country." "Holden has been an iconic... brand for Australians, a part of our heritage," said Mr Truss, who is standing in for Tony Abbott who has been in South Africa for Nelson Mandela's memorial. "It's meant a great deal to Australians over several generations," Mr Truss said. "Many of us have had the pleasure of travelling and owning Australian-built Holdens and it is a pity that that will not continue into the future. "Now this government had indicated right from the very beginning that we wanted Holden to remain manufacturing cars in Australia. "We've wanted," he continued, over loud jeers, "we want to have a strong and active motor vehicle manufacturing industry in Australia." Treasurer Joe Hockey said the government would do what it could to work with unions and the governments of South Australia and Victoria to help the workers “transition” and prepare for losing their jobs when Holden leaves Australia in 2017. Mr Hockey said it was “no surprise” that Holden was leaving and wondered why Labor had not shown similar outrage when Mitsubishi and Ford left Australia. Labor asked the Industry Minister Ian Macfarlane why the Abbott government cut $500 million from automotive funding. Mr Macfarlane said Labor MPs had immediately degenerated to “raw politics” when Holden factory workers were going through an “extraordinarily traumatic time”. “Not one word of sympathy from the members opposite,” Mr Macfarlane said. “Not one word of, "We'll cooperate with what the government puts in place to ensure the industry and economic diversity of Adelaide is continued." Acting Opposition Leader Tanya Plibersek accused the government of getting “exactly what it wanted” with Holden announcing its departure. The letter sent by Mr Truss on Tuesday to Mr Devereux was “designed for political consumption rather than being a genuine effort to communicate,” Ms Plibersek said. In a press release explaining the decision, General Motors chairman Dan Akerson said the decision to end manufacturing in Australia "reflects the perfect storm of negative influences the automotive industry faces in the country". Mr Akerson blamed the high Australian dollar, high cost of production, small domestic market and "arguably the most competitive and fragments auto market in the world". "Holden will continue to have a significant presence in Australia beyond 2017, comprising a national sales company, a national parts distribution centre and a global design studio," the statement says. Holden managing director Mike Devereux said an important priority over the next four years would be to ensure the "best possible transition" for workers in South Australia and Victoria. "This has been a difficult decision given Holden's long and proud history of building vehicles in Australia," Mr Devereux said. The sale and service of Holden vehicles will be "unaffected" by the announcement, the statement says. Warranty terms and spare parts availability will remain unchanged and Holden is likely to continue selling vehicles under the Holden brand rather than adopt a global one such as Chevrolet. Hundreds of workers began streaming out of Holden's Elizabeth plant after receiving the news shortly before the close of its day shift. Workers said Mr Devereaux spoke for 10-15 minutes to break the news that Holden would no longer manufacture cars beyond 2017. He was loudly heckled during the speech. "We're just shocked, we knew it might have been coming but we've all been trying to stay optimistic. "Merry Christmas, isnt it?" said one worker who left the plant. "Workers will find a lower paid job with poorer working conditions," said Professor Roos. "Many will not find work at all." "I've been waiting for a package anyway" said Rob Williams, who worked on the door production line for 19 years. Others were angry and shouted and honked as they left. "A lot of people have high mortgages, it's going to be a stressful 4 years for them," said craig Oxenham who has worked in the wheel and tire section for 26 years. "Im going to be 47 when it closes that's getting into the age bracket where it could be hard to find work." Steve Holliingsworth worked at the plant for 36 years before retiring in 2007. He said he saw the strain of uncertainty in his son who works at the Elizabeth plant and had been forced to move home because of financial uncertainty. "He just goes in his room and shuts the door," he said. "They won't say anything's wrong but you can see". The Holden announcement is also almost certain to force Toyota to follow suit, which relies heavily on the 160-odd component makers that rely on economies of scale to maintain competitive prices. But the determination of the recently-elected Tony Abbott-led Liberal government to cut vital funding to the industry also contributed. 2013 will go down as a dark year for the local automotive industry, with Ford confirming earlier in the year it would cease vehicle manufacturing by 2016. For almost two years the local manufacturers have been pitching its case for additional funding, pointing to overseas funding models that deliver generous incentives for automotive manufacturing plants. The only thing that will save labor intensive industries in Australia, will be a major decrease in both the wages paid to workers AND a reduction in the cost of living. CUT the "aussie tax" we pay on everything and we wouldnt need to be paid so godamned much. It's not as simple as that. Take a look into the wages paid to executives first before you say Aussie workers get paid too much. The banks are a classic example, millions of $$$ paid to chair dusters and they had the hide a couple of years ago to close branches? Sack some of the executives and put that money into manufacturing. I was an operations manager for a few years, (getting s**t pay btw) and it damn near ruined me mentally and physically, as you have a huge amount of responsibility, you dont get to shrug your shoulders and blame someone else and you sure as hell dont get to clock off at night and go home and forget the problems. i can only imagine the situation would be much worse the larger and more complex the organisation is. The only reward to being an exec is the f**k huge salary that comes with it, because if you f**k up and get fired there is no union to come and shut the place down untill your incompetent a*** is reinstated. Everyone loves to pile on management (sure there are some numpties amongst them) yet most people who whinge couldn't successfully manage a root in a brothel if given the responsibility. In Australia we have none of this, our politicians have failed us and we have failed ourselves by being greedy (both in wanting higher wages no matter the situation, and wanting the cheapest goods we can find) there is also a terrible culture of crying "poor little Aussie battler, woe is me" every time it is suggested we give something up (carbon tax etc) most struggling aussie families wouldn't know how to set and stick to a budget and waste so much of what they get. If i was in charge somewhere like ford/holden and redundancies came around id walk out into the carpark, and anyone driving a cheap imported car would be sent marching first, as they obviously do not give a s**t about the success of the company (rival manufactures vehicles made here are safe). Our pollies and media also need to stop selling us out, has anyone heard of the TPP? is it even being discussed just how badly this bends us over a barrel for big corporations to have their way with us?
" If i was in charge somewhere like ford/holden and redundancies came around id walk out into the carpark, and anyone driving a cheap imported car would be sent marching first, as they obviously do not give a s**t about the success of the company (rival manufactures vehicles made here are safe). " You and me both , it has always amused me how the workers who bemoan a company such as Mitsubishi , Ford and now Holden leaving the country , carry on about having worked there 28 years , 40 years ( pick a number ) and are passionate about the company and the company is my life etc etc etc then go and jump in their Hyundai or Toyota to drive home . the thing that's different with Toyota (other than Australians loosing jobs) is the cars they manufacture here are pretty much the same as whats sold over seas, eg camry, aurion carolla ect..so for those that like there Toyotas will still be able to buy them, just imported instead of built here..
where the falcon and commodore are going to be obsolete..
Yep it will be far easier for Toyota to pull out, very little development costs (compared to Ford Australia and Holden), Holden probably added to their demise by developing the first Australian designed Commodore, the VE, unlike Ford Aus doing it for over 41yrs, it was always an ongoing local cost, far greater as Ford Aus developed the 4.0L which stupidly is not used anywhere else in the world.